It's gone warm again this week and the tides were nothing to shout about so I thought I'd try the carp in my local lakes. As usual I bought a small white loaf from the bakers (not so good to eat but stays on the hook well). From one loaf I can usually get a sandwich for lunch and enough bait for two or three sessions of carping (not bad for a quid). I chop a couple of slices into rough cubes about the size of a match box, stick them in a poly bag and I'm all set. A strong, very sharp, barbless size 6 or 8 hook is tied on the end of my line and that's it. I generally fish for an hour or two in the afternoon (I know it's not the best time for carp fishing but It's convenient). I stick the hook through the crust from the crumb side, twist it round 180 degrees and pull it back into the crust. This usually combats the depredations of the small rudd for five or ten minutes if I'm lucky. Then I have to choose where to fish so I walk slowly round the lake shore looking for fish and for likely spots. 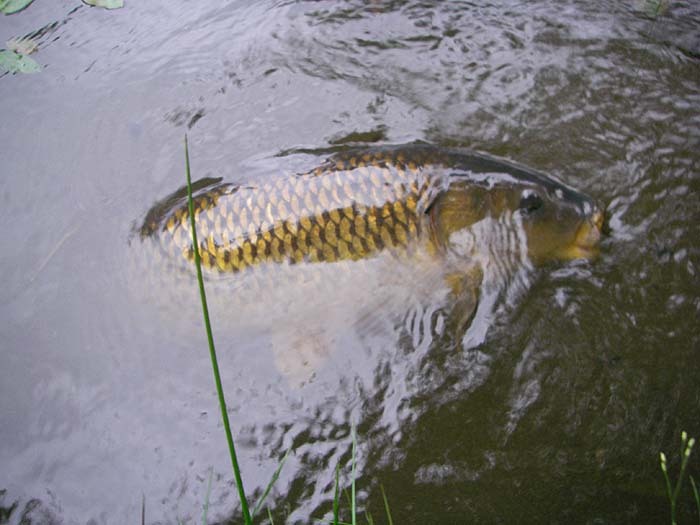 Fish are often visible at the surface in open water but I never bother with them except in desperation - they are rarely keen to bite. What I'm looking for are beds of lilies or pondweed with floating leaves, these are always promising and it's worth spending a minute or two to see if there are any signs of carp - trembling leaves, projecting tails, pouting lips, etc. In this case I simply flick the baited hook into a gap in the leaves near the fish, lay the line across the leaves to keep it off the water, put the rod down and wait. Overhanging trees and bushes are also good spots. If I see fish in the vicinity of such places I drop the bait across a twig so that the line hangs vertically down to the bait and lay the rod down. Reed beds are another reliable source of action. In this case I look for shaking reeds and cast to th general area so that the line is supported by one or two reeds, again tightening so that it hangs vertically down to the crust. My very favourite spots are right in the margins, particularly where the water's edge is screened by some sort of vegetation - irises, sedges, grasses, or sunken bushes and trees. Carp patrol along these margins looking for floating scraps and, at least where I fish, it often seems to be the bigger carp that have this habit - particularly in spots where nobody bothers to fish (too snaggy). 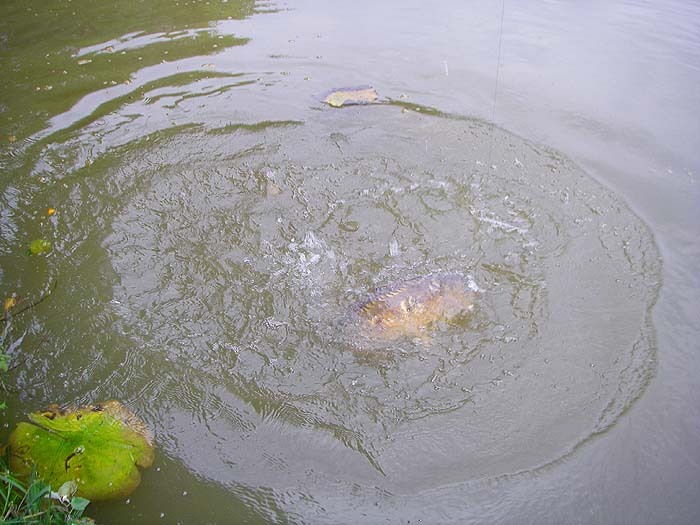 The bait is lowered over the edge with the tip ring projecting far enough to be directly above it and the line tightened just enough to allow the bait to float. As in other spots the rod is laid on the ground. 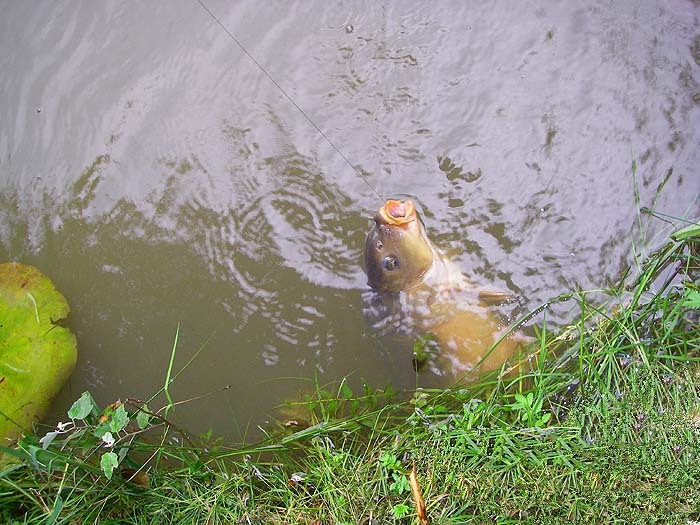 Just one tip - NEVER LEAVE THE ROD AND DON'T LET YOUR ATTENTION WANDER - it would be only too easy, wherever you are fishing, for a carp to hook itself (they almost invariably do) and to yank the rod into the lake. Anyway, my afternoon session produced three fish. First I lost a decent one in a patch of lilies (hook came out as it wallowed). 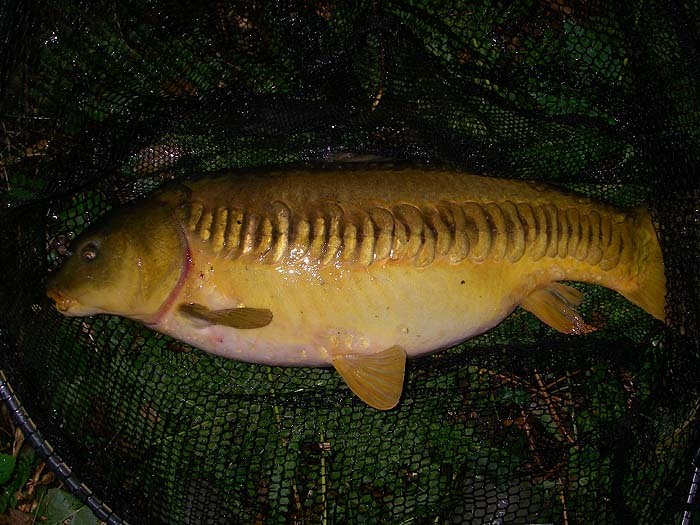 Then I caught a nice 'linear mirror' under an overhanging willow followed by another from the margin. The third one took a bait from within a patch of pondweed. They were all decent fish and gave me a few hairy moments as they ploughed throught weed beds and submerged branches. Good fun!